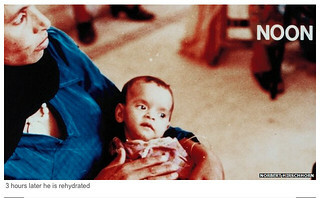 It is so hard to communicate just how effective ORS is at treating dehydration but these rare images say it all. The images have just been published by the BBC as part of this excellent article on the origins of ORS which includes quotes with one of its inventors, Dr Norbert Hirschhorn. 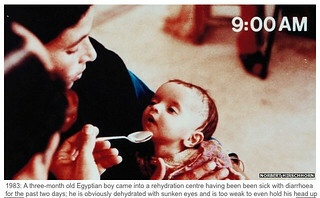 The caption on the first picture points out the sunken eyes – a symptom of dehydration – but note also the sunken fontanel (the flattened head) which is another symptom. These pictures were taken before Low Osmolarity ORS was invented – which is even more effective – and the ORS used in 1983 would not have been coloured or flavoured like the Kit Yamoyo ORS is. 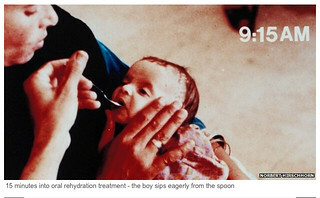 These images bring to life the Lancet assertion that oral rehydration therapy is: “potentially the most important medical advance” of the 20th century with UNICEF adding that no other medical innovation of the century “has had the potential to prevent so many deaths over such a short period of time and at so little cost”. 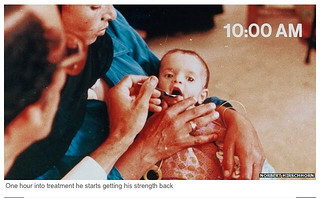 BUT, 30 years on, access to ORS (and Zinc) remains the key issue and that is what ColaLife is all about. Thanks to Tracy Levy (part of The Cola Road team) for drawing this to my attention in her tweet that popped up on the ColaLife homepage yesterday (2-Sep-14). So impressed by this simple medicine. You have done something beautiful for mankind! Thank you Simon and Jane for being so tenacious and bringing your vision to reality.